Your air conditioner isn’t just your best line of defense against summertime heat. It’s also your number one tool for managing high humidity. At this writing, summer is winding down in Atlanta. If you ever felt like your air conditioner struggled to keep you comfortable this season, it might be because the system wasn’t removing as much humidity as you’d like it to. 1. Keep your coil clean. When your evaporator coil (indoor) is covered in dust and dirt, it can’t remove all of the heat and humidity that it’s designed to remove. Even if the coil isn’t so dirty that it prevents the AC from cooling your home, it can still be dirty enough to inhibit moisture removal. The solution? Change or clean your air filter per manufacturer instructions. It’s that simple. As long as your air filter is doing its job, the coil shouldn’t be dirty. When your filter gets dirty, the blower fan will pull particulates around the filter and they’ll enter your air conditioner. Over time, these particulates will accumulate on the coil. You’ll have to hire a professional to clean it. 2. Adjust your fan speed. In hot, humid climates like ours, you want your air conditioner to move air at a rate at or near 350 CFM per ton. Many systems are set up to move air at a rate faster than that. 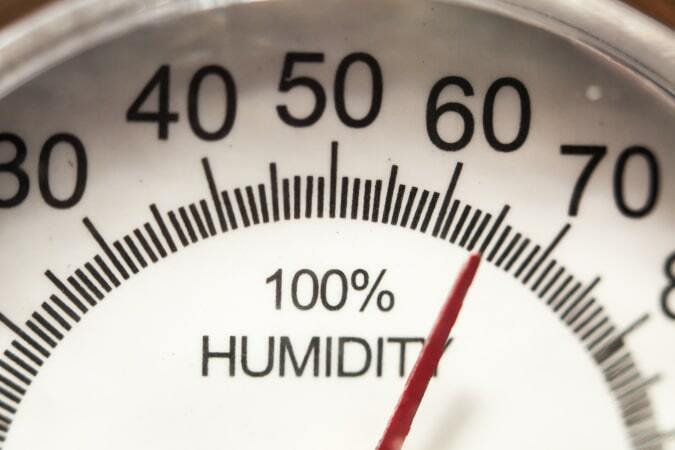 For humidity removal, a faster rate is not ideal. Say your system moves air at around 400 CFM per ton. Will the AC be able to remove enough heat from your home to satisfy your thermostat setting? Yes. All else being equal, it will. But will it also remove enough humidity from your home to keep you comfortable? Well..
At 400 CFM per ton, an AC is moving cooler air into your home pretty quickly. By setting it up to move air at a rate of 350 CFM per ton, the lower airflow allows the indoor coil to get colder. When it’s colder, it can remove more moisture while also satisfying your thermostat setting. A variable speed air conditioner will address this issue by default, by the way. 3. Install a thermal expansion valve, or TXV. Imagine you’re at the gym lifting weights. To stay hydrated, you’ve brought along your water bottle. The thing is, you’ve only filled it up halfway. Every time you approach your target number of repetitions, you realize you’re out of water. Instead of hitting your target, you put the weights down and refill your bottle… but only halfway. When it’s time to leave the gym and head home, you still haven’t hit any of your workout targets. You spent too much time going back to put water in your bottle. By filling your bottle up all the way, you could have taken fewer breaks and achieved the great workout you were aiming for all along. A TXV helps in much the same way. Just as keeping your water bottle full allows you to get a more complete workout, installing a TXV helps your AC remove more humidity during a given cycle. How? By using more of the evaporator coil. When you install a TXV, you’re actually attaching a bulb to your refrigerant line. The bulb opens and closes depending on how much refrigerant is needed to maximize the surface area of the indoor coil that can be utilized at any given temperature. If that sounds like word salad, here’s another way to think of it: A TXV improves the capacity of your evaporator coil to remove heat and humidity. If some portion of your evaporator coil was, in effect, not being used prior to installing a TXV, it will start being used after you install one. 4. Check your refrigerant charge. If the charge is too low, your AC will struggle to remove enough heat or humidity from your home to keep you comfortable. Eventually, this problem could morph into something worse: freezing of the coil or even compressor failure. Those problems are far more serious than just not feeling comfortable. You might have to deal with an expensive repair – or even replace your entire system! Needless to say, preventative maintenance can help determine whether your refrigerant charge isn’t right. That way, you might be able to address the issue before it causes more severe (and more costly) problems. HVAC system sizing: When your HVAC contractor installed your air conditioner, they might have installed one that was too big. This is a very common problem in our industry. You can read all about it here, but the bottom line is that overpowered air conditioners often don’t run long enough to effectively remove humidity from your home. Whole-house dehumidifiers: If you’ve done all of the the things we suggest in this article and you’re still feeling clammy and uncomfortable, a whole-house dehumidifier might be a good solution. When properly installed, these units function as auxiliary dehumidification for those times when your AC can’t remove enough moisture on its own. Tightening the envelope: As we’ve explored on this blog before, properly air sealing and insulating your home keeps temperature and humidity at optimal levels while reducing energy consumption. The more air leaks you can seal – especially in your attic and crawl space – the less humidity will enter your house in the first place. The same goes for duct leakage. Ultimately, your humidity management choices are all about comfort. If you can make your existing AC remove enough humidity to stay comfortable, that’s all you’ll need to do! But if you’re still struggling with high humidity after applying the fixes we suggest, know that you’ve still got options.